My son is the gatherer of rocks. He walks about our backyard, eyes scanning the ground for rocks of any size, any color. Finding them, he brings them inside and washes them in the bathroom sink, all the while excited about this treasure and the beauty he finds in them. Then he brings them to me. Now, the hutch is in a corner of our living room. It’s where I display treasured items; my grandmother’s old tchotchke, collectables, antique books. And now various rocks my son finds in my backyard. So I open the hutch and put the small stones along the edge of a shelf or between delicate tea cups. Last week he gave me his plastic penguin to add to the collection and a small pile of pebbles has gathered at the bird’s feet. Why am I allowing dull, half broken, plain jane rocks in my collection of beautiful things? Because my son gave them to me. He is a generous boy. One who asks his brother and sister what they’d like him to buy for them. The problem? He doesn’t value money. Not at all. He loses it and gives it away and refuses to take the dollar or quarter he’s earned doing various chores. He seldom has money to buy anything to give. So, what does he have? Time and a backyard full of rocks. Those little rocks have become precious to me. It makes me think of my dull and half broken efforts that I give to God. I come with a handful of underdeveloped abilities, trying to serve Him as best I can. He takes my small gifts, the only ones I have to give, and holds them in the palm of His hand. I ask him, timidly and anxious, if He thinks they are beautiful. He tells me that He does. Closing His hand over them, He takes them to the place where he keeps all the beautiful things brought by others who aimed to glorify Him. My offerings look dingy and small next to the martyr’s sacrifice or the lives devoted to serving the poor. They seem lackluster when put beside the beautiful gift of the missionary. Seeing what I’ve given compared to what others have brought makes me feel little. 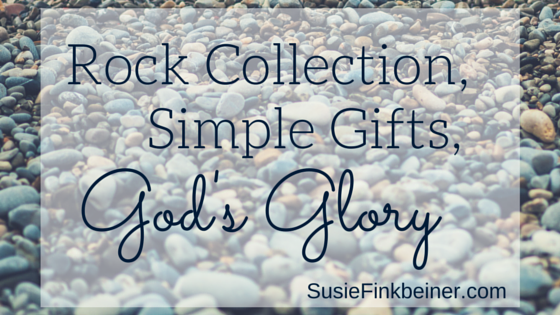 But God stands back and looks at His collection, the gifts from His children. I like to think He smiles and feels that warmth in His chest that parents are apt to feel. That glow of love for our kids. And somehow, beyond reason, my small gifts become every bit as beautiful to Him as everything else in His collection. Even the smallest of gifts shines with the reflection of His glory. Oh, Diane, I’m with you! I always feel a bit baffled by such things as you described. My brain just works differently. But you are right, you have something beautiful and unique to give God. I know He loves you deeply. This blog made me cry. I had to reblog it. It caused memories to flood back of when my son was that precious age. He collected rocks then too. I always imagined him becoming a geologist. Unfortunately, that never happened, although he always loved geology and studied it for two years in university before dropping out. :(( He also had that generous heart and desire to help others. He now works in sales as a team leader. Enough this time in your life. It can never be replaced. Oh, thank you for sharing about your son. How special. I can tell how much you love him and that is a beautiful thing. This is priceless! Not only that, I’m happy to know that I’m not the only rock hound, or Mom and Nana who has collections of stones/rocks all around. 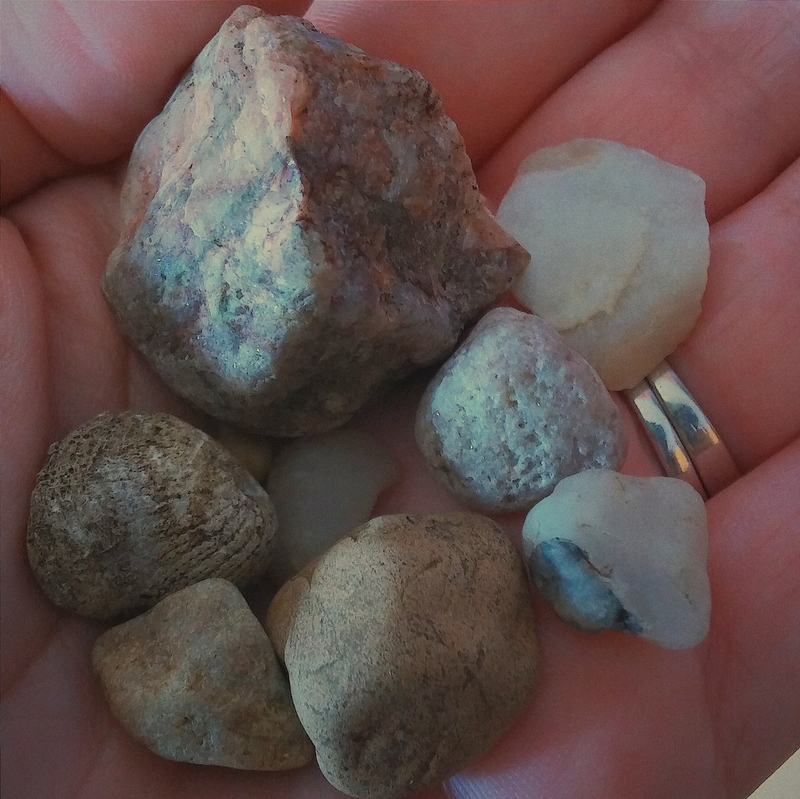 Petoskey stones are among my favorites, but those stones that the children have gifted to me are the ones with real value! Aw. I love that you collect them too, Nancee. I think I need to get a canning jar to keep them in.